With a character as large in life and who has lived as long in the memory as Frank Zappa has, it is fitting that a series of events celebrating his life and work could so dominate the Roundhouse this past weekend, the centrepiece of which was a Zappa plays Zappa performance. His eldest son, Dweezil, has been dutifully performing his father’s songs under that name, almost note for note, for years as his mother Gail wields a caring, but firm, hand over the great man’s legacy, pulling the strings from the California home they shared, which is still a living museum to one of Baltimore’s favourite sons. The Roundhouse, a perfect venue, had been selected for a programme of celebrations to mark what would have been FZ’s 70th birthday next month. An art exhibition here, a Q&A there, the events culminated in a celebratory gig. Having released 62 albums during his lifetime, there was certainly no shortage of FZ material from which to draw. The crowd, highly knowledgeable, took this, quite acceptably, as their chance to pay tribute. Some, no doubt, never saw him perform for real; those present were the kind of audience I’ve seen so often – teenagers at the beginning of discovery, hipsters who’ve spent many a night talking rubbish while listening to Hot Rats and balding record-fair attendees reliving their 20s, who saw the real thing but aren’t smug about it. The music FZ left behind was an encyclopaedia of the sounds he heard in his head – from doo-wop to jazz-fusion, from rock and classical to novelty. He might have smiled ruefully to note that his legacy in America is as someone remembered for arguing his anti-censorship-at-all-costs position, as a self-described ‘Constitutional fundamentalist’, on CNN (and in Congress) against the right-wing religiously-motivated moral guardians of the time (how little has changed) while getting his only hit with a bizarre tale of the dumbest Californian Valley Girls, featuring his then 14-year-old daughter Moon – who appeared to perform the song in the encore, joined by her adorable 5-year-old daughter Matilda, who shares Frank’s birthday. Being remembered for both music and politics is a legacy no-one would turn down. It was a joyous, rather family-oriented, atmosphere. The musical pinnacle was reached upon the performance, in entirety, of perhaps his most complete album, 1974’s Apostrophe. These are classic songs – from the oft-heard Cosmik Debris to the rather normal, in context, and even moving, Uncle Remus. The evening had started with a musically limited but game performance from a non-band – comedians the Mighty Boosh, lifelong Zappa/Beefheart fans, spent two weeks rehearsing, they said, for the show. Perhaps longer would have been a good idea, but that is their way: often appearing to indulge in little rehearsal and mostly getting away with it. They didn’t quite pull it off but it was a decent effort nonetheless, mostly due to their visible delight at having been included in the events of the weekend. They were well received and, in truth, I quite enjoyed their show (which would have benefitted from some visuals other than costume) until the ‘real’ musicians came on and, guitarist Julian Barratt aside, I accepted that heartfelt amateurism was the best they could offer. Still, they did employ Diva Zappa hidden inside Charlie, a pink, triangular, cowboy-hat-wearing, moustachioed, formerly animated, puppet made of chewing gum, which her old man would certainly have approved of. One couldn’t help, however, sparing a thought for the path of the handsome Zappa family members. Being rock progeny is no easy task, since you can’t match up to your ancestry if you choose to follow the same medium. Even if you choose another outlet you’re still going to get compared to a figure you can’t live up to. However, there’s no doubt that Dweezil is a gifted guitar player, seemingly happy enough to recreate his music as a way of staying close to his father, and flexible enough as a musician to add his own flourishes along the way. Younger brother Ahmet is an ideas man in the Hollywood movie industry, which seems like a satisfying way of letting his original mind run riot. Moon, the oldest, is a sometime author/stand-up comedian and the youngest, Diva, who seems the most unaffected by the burden of Zappa-ness, is a painter and a creator of knitwear (really). Other people’s expectations don’t seem to affect them; they all seem happy enough. Not all of their contemporaries are as lucky. One might say an exception was Jeff Buckley, but his father Tim hardly reached the levels of fame that would weigh heavily and, sadly, he was only around to make one remarkable album anyway. It’s true that the McCartney kids have turned out pretty well, as has Duncan Jones, now an acclaimed filmmaker, who has flourished since his dad, Bowie, retired a few years ago. But Lennon’s kids struggle, making unremarkable music, and the Stones/Rod/Geldof/Osbourne offspring just haven’t bothered at all (being a model doesn’t count) and have adopted the job of being socialites (one of the least attractive words in the English language). Whatever you do, you’re on a hiding to nothing. Use the name and you’re accused of profiteering, ignore it and the media press you on whether you resent your parents. Any talent you may have lives in their shadow. The Zappa kids seem remarkably level-headed, which is an achievement in itself considering they never knew what early bedtime was and their dad was away for six months out of every year. They’re all doing a bang-up job of keeping his memory alive in the right way, without attempting any projects that would have caused him to raise an eyebrow like he was hearing a wrong note on stage. Take note, Yoko. One imagined the performance was how a real Zappa gig must have gone: complex, chaotic, disjointed, compelling and hugely enjoyable. I’ve rarely felt such warmth radiating from the audience to the stage and back. Once the fantastic performance of Apostrophe had ended the show did somewhat descend into a blizzard of muso noodling and guitar solos, as Dweezil was joined onstage by Scott Thunes and Jeff Simmons, who had played, at different times, with Zappa. 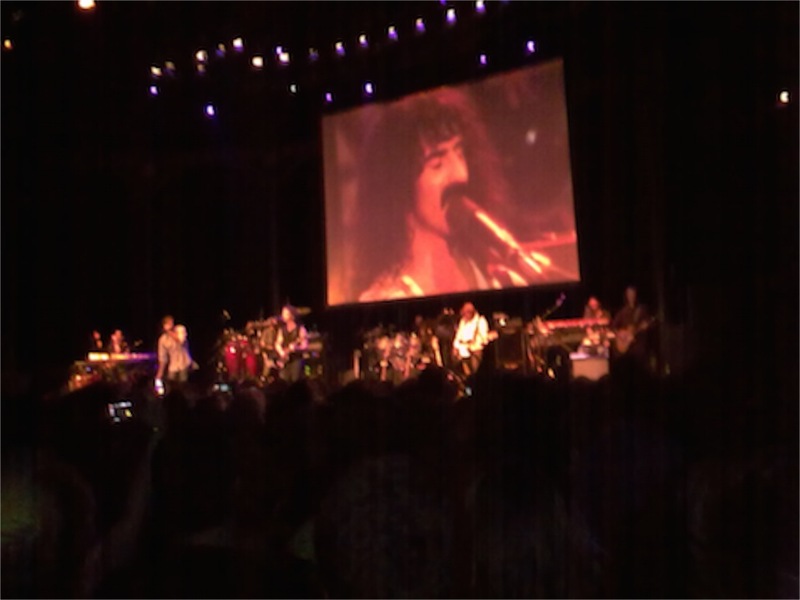 Unavoidably, the best bits of the night were when the onstage band played with a recording of Zappa on the big screen, looming over us, as Dweezil puts it, from ‘grave to stage’. It’s a tough legacy to follow but one that is easy to honour.